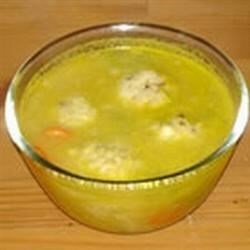 "This is a kosher for Passover soup which consists of meatballs made of chicken and matzo meal and eggs along with white rice. This is a personal favorite!" Bring a large pot of salted water to a rolling boil. Place 8 eggs in the boiling water; let the eggs boil for one minute, then remove the pan from the heat. Let the eggs sit for 15 minutes before removing them from the pot. Let them cool, remove the shells, the white portion of the eggs (save or discard the white), and chop the yolks. In a medium bowl, mix ground chicken, beaten egg, matzo meal, salt and pepper to taste, and cinnamon. Form mixture into walnut-sized balls and refrigerate until ready to cook. In a large saucepan over high heat, bring chicken broth to a boil. Add rice and chicken meatballs, cover, and lower heat to medium low; simmer for 20 minutes or until the rice and chicken are cooked. Ladle into soup bowls and garnish with hard-boiled egg; serve. Easy,delicious and a winner! I'll be sure to add this to every seder! This sound soooo good. I am not Jewish, but love matzo ball soup and this looks like a real winner. Thanks for sharing this recipe!